Two apartment buildings being designed by Runberg Architecture Group will be near a 3-acre central park. The total housing will be about 2,600 units — almost double the original plan. The office component is about 28 percent of the original plan. When Esterra Park was first announced about five years ago, it was envisioned as a mixed-use neighborhood on 28 acres in Redmond that would have offices, a hotel and apartments — and cost as much as $900 million. 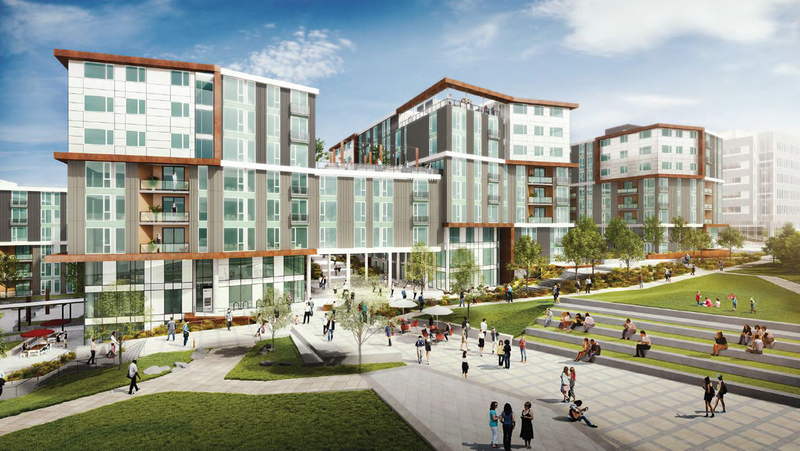 But the market has shifted, and Capstone Partners is now adding another 610 housing units to a development that hasn’t yet signed a single office tenant. However, Capstone’s Mike Hubbard says there has been enough interest in office space that the company will soon begin constructing one speculative office building — of the five that were originally planned. Block 3, on the northeast corner of Esterra Park, will have about 235,000 square feet of office space on six floors. ZGF is the architect and JTM will be the general contractor. Capstone hopes to start in February. CBRE is handling the leasing. Part of the original appeal of Esterra Park was its walkable proximity to Overlake Village Station, where light rail service will begin in 2023. Capstone and financial partner Lionstone Investments purchased the former Group Health campus in 2013 for $32.5 million. The initial plan, and the city of Redmond master use permit, was for as much as 1.2 million square feet of offices in five buildings, 1,400 residential units and the hotel. Demand for offices has lessened after the 2014 master use permit, which Capstone allowed to expire and then modified. Since 2014, partly as planned, Capstone has sold off chunks of Esterra Park for residential development to AvalonBay Communities, Lincoln Property Co. and Canadian firm Ledcor Group. The 181-room hotel, by Starwood, has opened on the northwest corner. Two of AvalonBay’s apartment buildings are now open, says Hubbard, and are leasing nicely. They also have small amounts of retail space — meaning cafes, delis, etc. Office demand has lagged, in part, because Microsoft opted to redevelop and expand its own nearby campus. Most of the office blocks on the old Esterra park plan have been gobbled up by residential developers. Last week Capstone sold Block 6B for $10 million to Redmond, which is holding the site until Imagine Housing buys it next year. 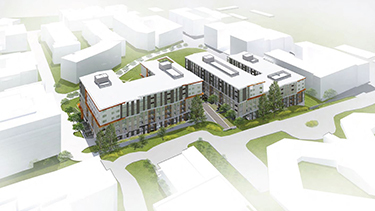 Imagine and SRM Development will build 260 units — half of them affordable — in two new buildings. That $48 million project will also include a YMCA childcare center. Imagine says financing is secure, but it’s still working out the terms of its future partnership with SRM, and hopes to break ground next year. Meanwhile Capstone recently filed residential plans for two of the former office blocks on the north side of the neighborhood, at 15300 N.E. Turing St. On what it now calls Blocks 2A and 2B, two buildings are being designed by Runberg Architecture Group. The project had its second design review last week. The 3.2-acre site is immediately north of the 3-acre central park, which will start construction once the apartments are substantially underway. The apartments will break ground late next summer and take about 30 months to build. Exxel Pacific is the general contractor, and Brumbaugh & Associates is the landscape architect. About 590 parking spaces will be mostly underground on the sloping site. There will be two garage entrances on the east and west sides of the buildings, which will be separated by a mews. The buildings will also be connected by a three-level pedestrian walkway overhead. This would bring the total housing to about 2,600 units by five developers including Capstone — almost double the original plan. The office component has shrunk to about 28 percent of the original plan. Meanwhile, Capstone was planning 178 units on a site it owns at 1115 Dexter Ave. N. But, says Hubbard, “We’ve paused that.” Designed by Weber Thompson and originally to be built by Venture General Contracting, that project hasn’t yet received permits. The corner site is immediately north of Dexter Station, which Capstone developed and later sold for $286 million. The offices are fully leased to Facebook, which poised for more growth in South Lake Union.